"Labeling America: Cigar Box Designs as Reflections of Popular Culture" showcases the unique collection of John Grossman which covers 90 years of cigar box labels and bands printed by four generations of George Schlegel Lithographers. This book takes these beautifully printed slices of American culture and combines them with the history of chromolithography into an interesting story of America's changing tastes and graphic standards. The good folks at Fax Chapel Publishing sent me a review copy of Labeling America. I have to say it is a beautiful coffee-table style book, which presents the laborius collection of American cigar lable artwork collected for decades by the author. Grossman is a legendary figure in the world of ephemera. His cigar label collection is now on display at The Winterthur Measeum. This book includes over 80 years of delightful printed ephemera that reflects the changing customs, attitudes, and ideals during Victorian and Edwardian life. Cigar box labels in the late 19th and early 20th centuries were not only amusing and beautiful to admire, they were a testament to the printing process of chromolithography and an important precursor to today's methods of product advertising. Labeling America: Cigar Box Designs as Reflections of Popular Culture showcases the unique collection of John Grossman, long-time Ephemera Society member, which covers 90 years of cigar box labels and bands printed by four generations of George Schlegel Lithographers. What makes this archive unique is that the Schlegel Company kept meticulous sample albums and files showing an unbroken record of American graphic style evolution. The work of many other lithographers of that era either destroyed or irreversibly dispersed their work. Now housed at the Winterthur Museum in Delaware, the carefully catalogued Grossman collection gives a glimpse into life at the turn of the century, when over 5 billion cigars were being sold in the United States via boxes with colourful labels depicting everything from women, animals, and sports icons to actors, heroes, and political figures. This book takes these beautifully printed slices of American culture and combines them with the history of chromolithography into an interesting story of America's changing tastes and graphic standards. JOHN GROSSMAN HAS DONE IT AGAIN! This critically acclaimed artist, designer, & best selling author has just completed his best work of all time! "Labeling America" is a combination of the history of the famous Schlegel Lithographing Co., plus, important images of over 800 of the rarest & most coveted cigar label artworks now housed at the Winterthur Museum in Delaware. Only a person with John's work ethic could ever dig out many of the truly important facts as to the growth, survival, & demise of this great company. Also, only a kind & patient person with John's personality could have charmed the certifiable (but loveable) curmudgeon George Schlegel lll during all their interviews. The book also includes rare, never before seen photographs of the complete operation of a 1908 stone litho printing operation recorded for posterity by Calvert litho which are now on display at the Smithsonian. This work is far better than any PHD thesis I have ever read, so congratulations to John, & to Fox Chapel for publishing it! About the reviewer: Joe Davidson is the past president of The American Antique Graphics Society, & author of 3 best sellers: The Art of the Cigar Label, Smoker's Art, & Fruit Crate Art. A librarian at the Winterthur Museum, Library & Garden in Delaware, introduces a highlight of the John and Carolyn Grossman Collection of printed paper ephemera: some 85,000 cigar box labels. Grossman has compiled this colorfully-illustrated gallery of labels from American, Canadian, Cuban, and European companies as a chronicle of male American popular culture from 1878-1965. He pays due to the George Schlegel Lithographic Company, New York City, that specialized in cigar box label printing. Labels include tributes to famous personalities, female beauty, and industry competition. It might be hard to believe, given today's strict smoking regulations, that cigar advertising was once everywhere. But for those of us who appreciate the artwork as part of the cigar experience, box art from the golden age has been collected in Labeling America: Popular Culture on Cigar Box Labels by John Grossman (Fox Chapel Publishing, 320pp.) Labeling America is a visual history of label art printed from 1849-1971 by three generations of the Schlegel family. George Schlegel Lithographers was one of the premiere American companies producing artwork for cigar boxes of the time, and this volume collects a wide and vivid sample of the artwork they produced. Grossman applies his expert knowledge in an approachable but informative history of the rise and fall of lithography and how the cigars of yesteryear connected with the artwork. The book traces the evolution of cigar advertising through trial and error, offering forgiving evaluations of a pioneering industry: "Some of the imagery now seems quaint, naive, even odd. Yet the beginning of familiar advertising themes can be seen, such as the portrayal of famous men and women on the labels, with or without their permission, suggesting product endorsement and use." The reprints in this book (which retails for $39.95) are actually from the John and Carolyn Grossman collection, which is on display at the du Pont estate Winterthur in Brandywine Valley, Delaware. John Grossman's painstaking work in authoring this volume makes for a pleasant read whether you're flipping through the decades of artwork, or reading it cover to cover, absorbing the history of a printing dynasty and a bygone era's elegant tobaccania." inStone now stocks a very informative book featuring the cigar box label collection of John Grossman. Mr. Grossman has been involved in collecting antique advertising art for many years. Although the book, "Labeling America" mainly features Cigar Box labels, the subtitle, "The Story of George Schlegel Lithographers 1849-1971," tells us that the Schlegel Lithographers were very instrumental in many other forms of advertising art. www.instoneinc.co Over 600 rare cigar box label images are featured in this very informative book; all in vivid color. "Labeling America" gives a good overview of the stone lithographic art process. Today's printing cannot match the beauty of the limestone lithography of yesteryear. Pages 156 through 208 outline the progression of label art from the 1880s through 1959. Actually, I found it hard to put this book down and I pick it up again and again. It isfantastic! All lovers of cigar label art need to add this book to their libraries. The Grossman Lithography Collection is now housed at the Winterthur Museum in Delaware and is open to the public. You won't regret adding this book to your collection. For decades John Grossman and his wife collected antique cigar box labels and other printed imagery from the 19th and 20th centuries. Today, they own the largest collection of American cigar label artwork and ephemera. The couple have captured their life's work into a beautifully photographed, coffee-table style book, Labeling America. Covering over 80 years of printed imagery, the book not only reflects the changing customs, attitudes and ideals during Victorian and Edwardian life, but also provides the story of four generations of George Schlegel Lithographers-the family who printed and produced the cigar artwork. The book represents a rare look at an amazing in-tact collection of work that will fascinate not just cigar heads, but artists, graphic designers, historians, antique enthusiasts and anyone interested in American culture. LOOKING AT HISTORY OUTSIDE THE BOX "A woman is only a woman, but a good cigar is a smoke." Rudyard Kipling may have written that line with tongue in cheek back in 1886, but in those days a good cigar was unquestionably a valuable commodity. Cigars were smoked by cowboys and capitalists, socialites and soldiers, shopkeepers and sodbusters. The cigar was among the first products to be mass-produced, elaborately packaged and marketed to virtually everyone in America. One estimate said four of every five American men smoked cigars at the beginning of the 20th century, when some 20,000 U.S. companies turned out more than 7 billion cigars a year. To sustain that kind of business, cigar manufacturers employed the latest printing technology to make their cigar boxes as eye-catching as possible. Creative printers turned the cigar box into one of America's first full-color promotional packaging devices and, in the process, left an amazing chronicle of life in Victorian and Edwardian America. Tucson resident John Grossman has just published a book depicting the rich history of cigar-box art through the work of one company, George Schlegel Lithographers, whose family-owned New York City business passed from father to son through four generations from 1849 to 1971. Grossman obtained important documentary material for his book from Peter Schlegel, the oldest son of the fourth and last lithographing George Schlegel and a longtime Tucsonan. Titled "Labeling America: Popular Culture on Cigar Box Labels," Grossman's book is filled with color reproductions of the artwork that graced cigar boxes from the mid-19th century to the mid-20th century. The artwork portrays many of the notables of the age: actress Ethel Barrymore, baseball star Honus Wagner, author Mark Twain, Queen Victoria, Abraham Lincoln and Thomas Alva Edison. The dominant themes of the day show up on the boxes, too: patriotism and the Spanish-American War; American Indians depicted as noble savages; the early days of the automobile; the rising opulence of the Industrial Age; and the growing reverence for America's colonial roots. Grossman chronicles the growth of cigar smoking from a novelty in the 18th century to full acceptance during and after the Civil War. Fortunately for cigar makers, the popularity of their product grew along with the development of "chromolithography," the color printing process that employed art drawn on and printed from heavy limestone slabs that made it possible to mass-produce images in full color. The book could never have been published if not for the passion Grossman and his wife Carolyn have for collecting ephemera - typically printed material such as posters, postcards and greeting cards meant to last only a short time. Their collection is housed in the Winterthur Museum Library near Wilmington, Del., and contains some 250,000 printed images. From the mid-19th century, when color printing became economical, retail businesses and manufacturers of all kinds used it to sell their goods. Few industries were as enthusiastic about color reproduction (particularly chromo lithography, or "printing in colors from stones") as American cigar makers. The most prolific creator of cigar box labels was a family-owned printing company that changed names several times but was run by four successive generations of men named George Schlegel, who produced hundreds of cigar box labels, box trimmings, flaps and bands. 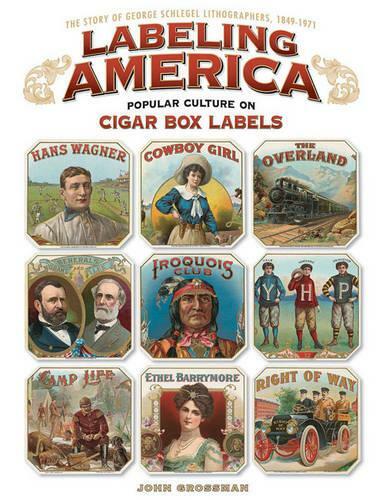 Their immense output is featured in John Grossman's LABELING AMERICA: Popular Culture on Cigar Box Labels (Fox Chapel, $39.95). The John and Carolyn Grossman Collection of chromo lithography, housed at the Winterthur Museum in Delaware, includes 250,000 specimens of this early and often exquisite form of color printing - the high-definition medium of its day. The Schlegel archive's original art, proofs, embossing dies and litho stones are abundantly represented in this splendidly printed book. But the art is not the only point of interest. The text offers a brief history of how graphic design evolved from a sideline of printing into an integral profession. Among the most popular promotional genres, cigar labeling expanded throughout the late 19th century. "The popularity of cigars was big, but many of the cigar manufacturers were small," Grossman says of their inability to make custom labels. "The lithographers responded by creating myriad stock designs and titles that could be ordered by number." Schlegel's line of "sample labels" began in the 1880s, and many shown in the book are unaffiliated with any particular manufacturer. The art themes run the gamut from exotica (Monkey Brand) to erotica (Art Club, featuring a naked rump), from historical (Gettysburg) to hysterical (Tampa Fad, with a rooster smoking a cigar), from celebratorial (Mark Twain) to educational (Vassar Girl). Only a few are purely decorative. And some, like one titled "Two Friends" showing a woman shaking hands with a St. Bernard, are nonsensical. Yet all in all, they are amazing examples of commercial art. For anyone interested in printing history or aesthetic ephemera, not to mention cigar box art, this is a jewel of a book.